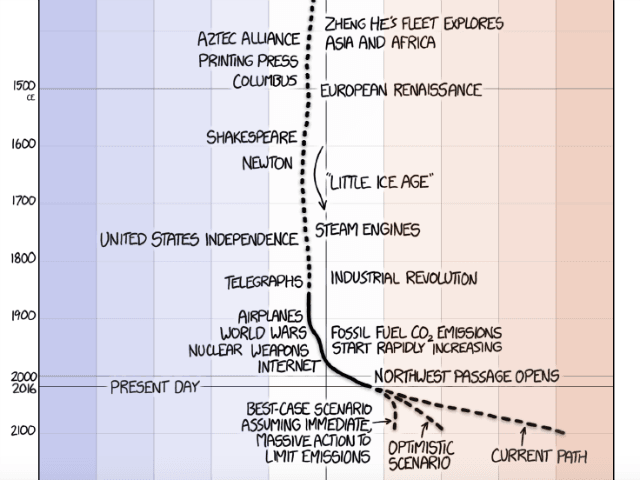 There’s a cute, nerdy cartoon – A Timeline of Earth’s Average Temperature – that has been doing the rounds on the internet by bestselling author Randall Munroe purporting to illustrate the dire, unprecedented threat that is man-made global warming. It’s at a site hugely popular with geeks and nerds called xkcd – “A webcom of romance, sarcasm, math, and language”. Millennials will look at it and go “Wow, that is like totally sick!”, their eyes opened as never before to the menace of late 20th/early 21st century climate change. They will go on demos, launch petitions on Change.Org, demand of politicians that ever more stringent action be taken now. This is why we need some kind of reverse Logan’s Run where everyone under thirty – sorry kids – is put permanently out of their misery as a punishment for being so credulous, self-righteous and stupid. Or, if that sounds too extreme, then at least let us join Jo Nova and William Briggs in humiliating the author of this utterly misleading cartoon so as to prick his bubble of pompous, ignorant, self-regarding, passive-aggressive, pontificating greenery. The cartoonist Randall Munroe is the author of a bestselling pop-science book called What If? and was named by Wired magazine one of the 20 key influences of the last 20 years. According to William Briggs – Adjunct Professor of Statistics at Cornell – who has deconstructed Munroe’s blogpost, we shouldn’t be too hard on Munroe and his crappy cartoon because it is just repeating rubbish he heard elsewhere. I’m just this guy, you know? I’m a CNU graduate with a degree in physics. Before starting xkcd, I worked on robots at NASA’s Langley Research Center in Virginia. As of June 2007 I live in Massachusetts. In my spare time I climb things, open strange doors, and go to goth clubs dressed as a frat guy so I can stand around and look terribly uncomfortable. At frat parties I do the same thing, but the other way around. Munroe – in his charming “hey, I know this is like, science, man but it’s fun and unthreatening too don’t you think?” handwriting – offers us three options of global temperature paths: “best-case scenario assuming immediate massive action to limit emissions”, “optimistic scenario” and “current path”. Will it surprise you to learn that even the “best-case scenario” is quite terrifyingly dire? No, of course it won’t because we have heard this crap many, many times before from the usual doom-mongers in the climate alarmist establishment. But as Briggs points out, there is no evidence for this. None. That scary uptick on the graph – just like the one on Michael Mann’s many-times-discredited Hockey Stick – is the creation of computer projections which have been repeatedly proved wrong by observed reality. The flashy temperature rises (the dashed lines) at the end are conjectures based on models that have repeatedly been proven wrong — indeed, they’ve never been proven right — by predicting temperatures much warmer than today’s. There is ample reason to distrust these predictions. Briggs goes on to list why Munroe’s chart is flawed stastically. For example, the way it pretends there is certainty about the 20,000 year temperature record when, of course, this is quite impossible: the best we can do is make deductions from proxies such as coral growth rates. Jo Nova has helpfully designed an illustration of her own explaining how you too can create a scary 20,000 year climate chart guaranteed to terrify kids. And if you think that we’re all using a sledgehammer to crack a nut here, just remember, as Andrew Breitbart said, that politics is downstream from culture. Very few teenagers and twentysomethings are ever going to read an actual science paper by Michael Mann or Kerry Emanuel or Gavin Schmidt – then again, who could blame them? – nor pay heed to yet another speech by Barack Obama or the Prince of Wales warning of the urgent climatic threat to our planet. But if that “science” is couched in the form of a cartoon, suddenly they’re interested – and dangerously certain. That’s why I’m not giving Munroe the benefit of the doubt.